It’s always a bit of a challenge to take last year’s results and even make an educated guess as to what that means in light of returning players, but it is a useful guide. 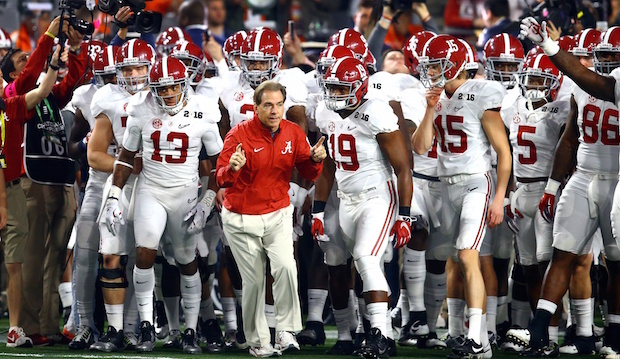 Alabama as well as the teams they beat in the SEC and national championship games, respectively, had relatively few returning starters last year. Alabama and Clemson had 11 apiece, and Florida had 10. Alabama hasn’t seemed to need too many returning starters, but returning starters are still a good indicator of which teams will and will not improve. On the other hand, it’s not hard to find disappointments among the teams who had relatively few returning starters. Many expected Auburn, for instance, to compete for championships. Their results were much less disappointing when you realize they only had 12 returning starters from an 8-5 team in 2014. Georgia, which started last season in the top 10, had the same number. The Bulldogs finished outside the AP top 25 and barely made the final coaches’ top 25. Mississippi St., which had one of the smallest numbers of returning starters (9), was less surprising but still went from 11 and 12 at the end of 2014 to unranked (in the national polls anyway) at the end of last year. Oregon fell from #2 in the final poll in 2014 to about #20 at the end of last year after having 12 returning starters. Arizona was also a strong team out of the Pac-12 in 2014, finishing #10 in the CFP standings before the bowls. The Wildcats only had 12 returning starters and didn’t receive even a vote in either poll after last season. Another team with very few returning starters was Boston College (9). They went from a bowl game in 2014 (and nearly a huge upset of then-undefeated Florida St. in late November of that season) to finishing 3-9 last season. Two of those three wins were over FCS opponents. According to Phil Steele, other than the ones I mentioned at the beginning, no other teams with 11 or fewer returning starters posted improved records over the prior year. Of the 26 teams with 16 or more returning starters, 19 had improved records and only two had worse records. So a program that traditionally has depth and does a good job recruiting can maintain the same basic level of play with 12 or fewer returning, but few very can improve, especially not substantially. For instance, no team with 12 or fewer returning starters finished in the top 10 last season after finishing outside the top 10 in 2014. Stanford, Iowa, Houston, and Oklahoma all had 13 though, so it doesn’t have to be among the highest numbers. All four returned their respective starting quarterbacks last year. Going back to Alabama, I don’t normally do this with returning champions with 11 returning starters, but I consider them #1 until proven otherwise. It also doesn’t hurt that the Tide was in the top 4 after the regular season (including conference championship games) the last five years in a row. I hate when people say a team “reloads”; but if it ever fit a team, it fits them. In the first of those seasons, there was an interesting situation wherein the Tide lost during the regular season and did not make the SEC championship game yet won the national title. There might just be a similar predicament this year since the 18 returning starters of LSU could do some damage in the SEC as well. LSU has not beaten Alabama since November 2011 but seems to have all the pieces in place, with the possible exception of the quarterback position. So that’s my top 2. Had LSU won maybe one more game and had Alabama not won the national championship, the two teams might have been reversed, but I’m more comfortable with Alabama anyway since they’ve obviously been more likely to win the key games toward the end in recent years. Also, I don’t think the Tide’s early-season nemesis Ole Miss is going to beat them again with their 10 returning starters. Also, I’ll probably get enough harassment from having LSU #2. Apart from Alabama, I was skeptical of other teams with 11 or fewer returning starters, but those that were good enough to finish ranked last year I placed in the 18-25 range. Three teams that I really liked last year (Clemson, Iowa, and Stanford) had 12 returning starters apiece, so I put those in the top 10, but I’m not expecting those to make national semifinals. The ACC may come down to Florida St. vs. Clemson for the sixth straight season, and the Seminoles look to take back control of the rivalry. I thought about putting Clemson higher, but they had a pretty close game with Florida St. last year. They were tied going into the fourth quarter, and I think part of the reason they won was better relative experience last year (they had the same number of returning starters, but most of the Seminoles’ returning starters were on a defense that wasn’t very good). When it’s 17 returning starters to 12, I think we can expect the script to flip. 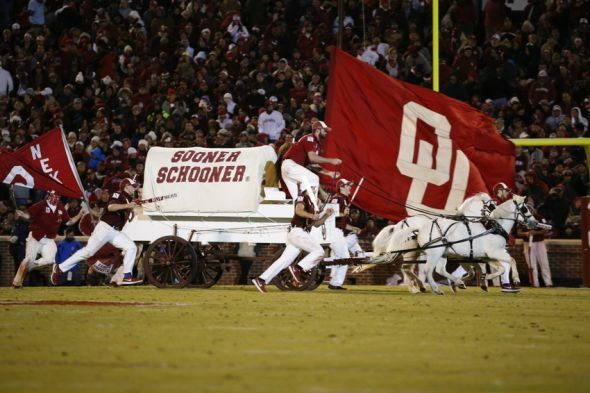 Last year saw the Sooners return to national -championship contention for the first time in several years, and they are still the team to beat in the Big XII. There were a lot of teams who finished in the 20-32 range last year with substantial numbers of returning starters, but they have to prove more before I put them in the top 10, so that describes teams 11-17. It’s going to be interesting to see how 11-17 compares with 18-25 (except for Wisconsin) and with the three 12-returning-starter teams. After the top 25, I list teams I left out by number of returning starters and last season’s adjusted rank. I’ll talk about this more later, but I decided to alter my formula slightly, and I looked at the adjusted ratings for last season when deciding the preseason rankings below. In short, it works the same basic way, I just gave a little more credit for quality wins, so when I start using computer ratings again (likely in early October), the teams you beat will be a little more important and the teams you lost to will be a little less important. I’ll do my full rankings chart and mention the Week 1 match-ups later in the week. The Broncos were the highest finishers among unranked teams in pre-season. I’m including the Horned Frogs since most people had them even higher at the end. I haven’t noticed any major media organization that does this. I guess they just want to be able to come out with new preseason rankings in six or seven months and have people accept them. Surely, I suppose they think, people will have forgotten last summer by then; but they might not forget something six months before, so best not to remind them. I think it’s fun though, so I’m doing it. Some of these differences are owing to differing philosophies. I think Sagarin is just based on accumulating recent rankings. Sports Illustrated and the polls are mostly based on predictions; but sometimes there is deference to teams that did well last year even if maybe they shouldn’t be expected to do well in the coming year. What I mostly do is look at who I think will be the best teams right away, so I’m a little more interested in returning starters, and of course I also take into account last season. If a 1-win team has 23 returning starters next season, you wouldn’t expect them to finish with a winning record; and if one of the top teams this year had only 10, they might finish in the top 10 again. But when in doubt, I’m going to go with the team that has proven more in the last year or two and has more returning starters. If a team has very few, I count recent seasons for less. That’s why Oklahoma St., for instance, was not a team I ranked. Here are my Preseason Rankings. I also did an SEC West Preview. The teams are listed in order of how they finished in my final rankings. Even when I heard about Braxton Miller, I didn’t move the Buckeyes down. I had a feeling this would be a very good team with 12 returning starters and one or two players wouldn’t make a difference. So even though I didn’t put them very high, I think I used sound reasoning. Also, when I do preseason rankings, I have a skeptical stance toward untested players, and it’s not quite as much about potential as how much they have to start the season. The loss came pretty early. There just wasn’t a compelling case to drop FSU down after last season. None of the other contenders stood out, and there really wasn’t an impressive team overall on the field either. I can’t complain about my pick here. The Ducks had the highest number of returning starters among teams that were ranked after 2013, so I was not shocked to see them in the title game. I didn’t have Alabama first in the SEC, I had Auburn. That’s not how it worked out, but Alabama was actually less dominating in most games than I thought they would be. They just won all but one in conference. I thought the Broncos might be done with these seasons given the fact that coaches keep leaving, but few apart from maybe some Marshall fans can argue they weren’t the best non-P5 team this year. I thought the Horned Frogs might bounce back, but I was thinking maybe 7-5 or 8-4 instead. I’m not sure whether to give them credit or the rest of the conference blame. The Bruins finally had the top-10 season we’ve been promised a few times in the past. I mostly only put them this high because I couldn’t find other teams that were very compelling, but like I said earlier, that turned out to be the case in reality, so that’s why I got this one right. I couldn’t tell how much of the preseason buzz was based on the previous year or based on how good they really seemed. Looking back though, none of the results of their games were different than I projected based on my ratings. I did think they might lose to some lesser team, so I guess I’ll give them credit for surpassing my expectations in that regard. Credit to SI here for ranking them at all. It didn’t even occur to me to rank a CUSA team, to be honest. Like I had started to explain with Ohio St., I think to an extent, you have to look at how good teams likely are relative to one another at that point. Georgia Tech really wasn’t that good early in the season. They struggled with Tulane (early on anyway) and Georgia Southern and seemed dead in the water against Virginia Tech, but they kept getting better, and it seemed like they were a much better late-game team than they possibly ever were before under Paul Johnson. These two are pretty much the same for me, so I’ll cover them together. I just thought they had one-off seasons in 2013. I didn’t anticipate that the two coaches would be able to “reload” so well. Missouri did lose the early game to Indiana and got blown out by Georgia, but they matured in a hurry after those setbacks. Baylor didn’t have early losses like that, but they did only have 9 returning starters, so 22 was high in light of that, at least from my perspective. Usually teams like that don’t come anywhere close to the successes of the previous version even though they get preseason rankings elsewhere. All the people who had them #12 did pretty well. I was right about how good they could be but wrong about how bad they could be. I would have never expected them to lose to South Carolina and Florida knowing about those two teams what I know now. Even though I had Auburn so high, I mentioned in the preseason that this was one of the games that might cause Auburn to have trouble winning the SEC West. I mentioned the Missouri game, but Auburn was an even more impressive big win at the time. I was surprised that Wisconsin ended up so high. I thought they would be more similar to last year’s team. But in my defense, they didn’t start out so well. On paper, they didn’t have much to start the season, which I think was an accurate understanding. I did a good job on this one. I didn’t expect them to make an appearance in the top 5 in the first place. This is an improving program though, so I don’t expect them to be an easy win in the SEC very often going forward either. They were too mediocre in 2013 for me to seriously consider them for the top 25, but as I had mentioned in my SEC West preview, I thought they could beat some of the better SEC teams, which they did. So I wouldn’t say I was shocked here, I was just more reserved in the preseason. 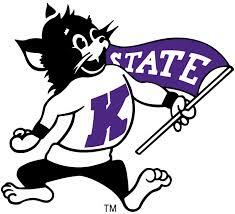 I honestly didn’t even consider the Wildcats. They had a number of teams with potential in the recent past and they all tended to fizzle, so I was most surprised to see them in the top 20. I thought there would be a second ACC team in or near the top 10, but I was wrong about which one. I remained skeptical about the Sun Devils based on so many seasons where they were supposed to have a good team and either didn’t at all or were wildly inconsistent. They were among the last teams I eliminated though. Where I picked them was a little ambitious, but where I dismissed teams with potential before, I thought USC would be more immediately good. This was not a good team to start the year though. Auburn was a disappointment in the end, but they were one of the best teams in the early going. They really should have beaten Alabama and Wisconsin later in the year. I think sometimes what happens is a team goes from competing for a national title to just trying to make a decent bowl and it’s deflating. Whereas another team that was mediocre the previous season would be excited to be ranked and so forth. Like Marshall, this wasn’t a team I looked at or considered. I think I was justifiably cautious about the Wildcats. Had the Big XII been more than a couple of teams deep, I don’t think they would have finished this high. For some reason, you get a bunch of flak for picking a small-conference team to perform similarly as in recent years, whereas other teams who have very little coming back are ranked with no one batting an eye. I have to admit I feel somewhat vindicated here. See Marshall and Colorado St. The Sooners made the cover of Sports Illustrated for the preview issue and received 4 first-place votes between the two major polls. They did look a little bit better early, but they just didn’t seem to improve from how good they were in September. They only showed a glimpse of the team they were supposed to be when they beat Georgia. This is a reminder going into next season that if you don’t have leadership (they lost their top defensive and offensive players after 2013), you don’t have much. Maybe I should have been more pessimistic here, but they didn’t finish that far outside the top 25. Still, I’m glad I wasn’t tempted to rank the Cardinal in the top 10. I looked at them as a similar team to Baylor, and for whatever reason, Baylor had a great season and Stanford didn’t. In my defense, I had LSU fifth in the conference. I had trouble judging which SEC teams would be better than which other teams. I was very disappointed with both coordinators overall. I don’t want to be sour grapes about former DC Chavis, but I expected better based on his very good years at LSU, especially before 2013. I think OC Cam Cameron may have forgotten how to develop a teenage quarterback rather than one well into his 20s as NFL starting quarterbacks typically are. LSU could have very easily won 11 games this year based on talent, but they also could have missed out on a bowl game entirely due to failures to close out games. I said the winner of LSU/Alabama would be the most likely SEC champion, so at least that part was true. Had LSU closed out that one and beaten Arkansas, they would have at least tied for the West title. I haven’t addressed the Music City Bowl in depth yet, but people who think that justified a top-25 ranking for the Irish are insane. Arkansas beat LSU 17-0 late in the season and since then beat up on Ole Miss and Texas, losing only to Missouri in a close game. Arkansas didn’t have a defensive stop over a touchdown gifted to them against LSU, and LSU’s defense didn’t just roll over on third downs time and time again. Also, somehow, Notre Dame made LSU look like a point-scoring machine at times. Anyway, I feel very justified in not ranking the Irish in preseason and in recognizing them as a bust now. Michigan was the only bad team of the group, but they shouldn’t have been a bad team at all. I think Texas is improving but will take another year. Florida and Duke were good teams at times but inconsistent. Central Florida nearly beat Penn St. for the second consecutive season but somehow lost to Connecticut for their only conference loss. Louisville may have been about right had they won the bowl game. Nebraska and Texas A&M were by no means horrible and might have been a couple of bounces of the ball from being ranked, but I don’t know where Oregon St. came from. I know they beat Arizona St., but that was one bright spot in dismal year. In fact, it was the Beavers’ only win of their last 7 games. Their BEST win was at home over San Diego St. I still don’t understand Nebraska’s hiring of Mike Riley, by the way. I’m not sure how Saragin’s preseason rankings work, but I think it’s mostly based on performances in recent years. Texas and Florida in particular would not have been surprising had the finished with those rankings. Oklahoma St. of course is ridiculous looking back, but it wasn’t too long ago that the Cowboys nearly made the title game, and in 2013 they were again one of the best teams in the country before dropping the last two games (Bedlam and the Cotton against Missouri). Like I said above, having A&M ranked wasn’t far-fetched, but of course #11 was a bit high to say the least. Washington never really clicked, but there was no shame in having them near the bottom of the top 25 in preseason. They made a bowl at least and played some competitive games against good teams. In fact, their only regular-season losses were to teams that were ranked at the time. Among those, only Stanford finished unranked. I covered everyone but North Carolina above. I have no idea why they were ranked. Anyway, I’m sure I’ll have upcoming posts about other sports and sporadically football, but like I referenced above, we’re about halfway to the next preseason rankings, so I plan to have a lot to say then. I guess I’ll start with some good news. I like how the top four stayed in place. If after the Alabama game anyone still believed Ohio St. didn’t belong in the top four, I’m sure they do now. Other than that, pretty much everyone agreed with the other three teams. Why does the fact that teams won these games mean that suddenly some of them aren’t in the top four? It doesn’t. If we made 5-8 play each other and then the winners of those games play each other, that would leave three teams in that group with one more loss than they had before the bowls as well. I am also pleased with my rankings before the bowls. Eleven of my top 17 (including Oregon) won their bowl games. All of the top 19 either won their bowl game or lost to another top-19 team. Colorado St. and Nebraska were the only top-25 teams to lose bowl games to other teams. I know Boise St. lost to Ole Miss, but losing to Baylor doesn’t hurt that much less. Boise St. also played an extra game. The Broncos were one of four 10-win teams in the Mountain West (all in the same division), while only two teams in the Big XII won 10 or more. This might be boring, but it might also be a way of explaining my rankings, so bear with me. On 11/23, TCU led Boise St. by about 0.12 (which was the approximate distance from Ohio St. to Oregon before the bowls). Boise St. won three games between 11/23 and the bowls (Wyoming, Utah St., and Fresno St.) while TCU only won two (Texas and Iowa St.). This cut TCU’s lead to 0.006. All things being equal, the TCU lead should have increased to 0.017 because Ole Miss counts for more points than Arizona does. So the 1-6 performance in bowl games by TCU opponents cost the Horned Frogs 0.021 by comparison since they ended up 0.004 behind the Broncos. Only three of Boise St.’s, but of the 13 games they played, 10 were against teams that went to bowl games (they played Fresno St. twice, Ole Miss, Colorado St., ULL, Air Force, Nevada, BYU, San Diego St., and Utah St.). For a non-mathematical argument, a lot of people thought I had Boise St. way too high and they shouldn’t have been ahead of Arizona. I think they corrected that perception. This is the fifth time since 2008 (when I started my current system) that Boise St. has finished in the top 6. By comparison, this is only Alabama’s fourth time in that time frame. Florida, Ohio St., and Oregon have finished in that group three times apiece. 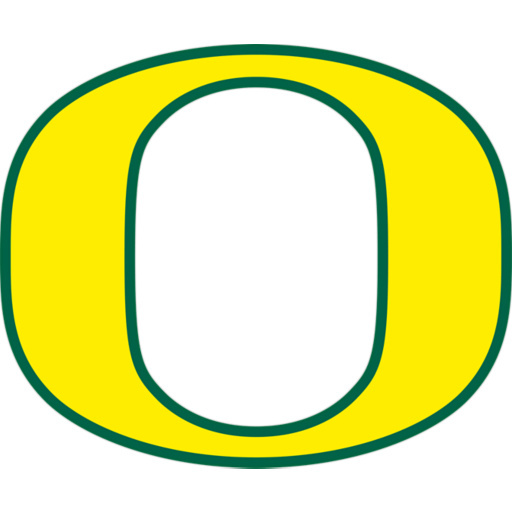 Not apropos of anything, but every time Ohio St. has been in that group, so has Oregon. I would have liked to have seen Marshall play a P5 team, but they did about as well against then-11-2 Northern Illinois as Arkansas had back in September. I do think Georgia Tech would have likely beaten them, but remember the point of my formula is so that teams with few losses end up near the top. Georgia Tech obviously had a much better schedule, but you have to have a much better schedule to account for two extra losses. I’m sure most of you remember when LSU had two losses and made the BCS Championship ahead of one-loss Kansas. That was a huge difference in schedule, but if LSU had three losses or Kansas had no losses, LSU would not have gone ahead of Kansas. I first started working on my current formula after the 2007 season, so that’s probably something I considered when I decided how much winning percentage counts and how much strength of schedule counts. I also think LSU would have beaten Kansas even if the Jayhawks had gone undefeated in 2007, but that doesn’t mean LSU would have deserved to play in the game ahead of them. Anyway, Marshall is in the CUSA, which went 4-1 in the bowls. Compare that to the 4-7 mark of the ACC. Also, bad losses hurt more in my formula than good wins help. The one team that beat Marshall (Western Kentucky) won its bowl game, but all three teams that beat Georgia Tech lost theirs. The top two teams of the SEC East (Missouri and Georgia) got into the top 15, finally passing up Ole Miss and Mississippi St., but they had too far to go to make it into the top 10. I think 19 of the top 21 being in P5 conferences is about right. I don’t mind giving some credit to the better teams of the other conferences at the bottom of the top 25. USC made a pretty decent jump forward after they beat Nebraska and several teams in the group immediately ahead of them lost. 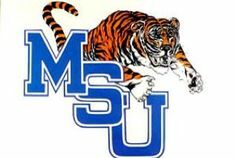 This is the completion of my 20th year ranking teams (although it was purely subjective before 2004), and this is the very first time I am ranking Memphis. Memphis is the 101st team I have ranked. This is slightly different analysis from my “conference report” series. In this blog, I’m commenting upon the rankings of the various teams rather than strictly looking at games between conferences. I do a summary of this with every ranking (except for the one after the Army-Navy game). You can see my chart here. The SEC finishes with only one team in the top 10, but six in the top 25, nine in the top 40, and twelve in the top 50 (the chart linked to above does not give any credit for the top 50, just the top 40). Even #13 Kentucky finished 68th, just four spots behind Virginia Tech (who, as I think most people know, beat Ohio St.). Although like most of the country, I was a little surprised by WHICH SEC teams won, I think the above shows how tough it was to go undefeated if 13/14 teams in the conference were good enough to beat who turned out to be the best team in the country. The SEC has 14 teams, and only 8 of them got to play Vanderbilt. The SEC might not have the best top teams (as was thought for much of the season), but if you think any other conference schedule was tougher, you’re kidding yourself. Kenneth Massey lists about 90 top-to-bottom computer rankings of teams on his comparison site. Every one of them has the SEC as the top conference (at least based on average ranking of the teams). I know people want to call me a homer, but until I’m not part of the overwhelming consensus (even if one or two come out that disagree, that’s still true), I won’t take that allegation seriously. The only rankings he lists on there that put the SEC second are the two (subjective) polls, but only the top 25 of each one is considered. Since the SEC has six teams between #26 and #50 in my ratings compared to only two in that range for the Pac-12, that’s ignoring a lot of the SEC’s relative strength toward the middle and below the middle of the conference. I believe these are all of this season’s bowl games. Apologies if I missed something. This went long enough just covering the top two conferences, so I plan at least one more blog to finish off the bowl list and another for the overall list. Before assessing the overall strength of conferences, we should discuss the bowl games, since that’s often the first place people go when talking about conference strength. I’m skeptical about the bowls being very decisive because all but four teams (until 2014, all but two teams) aren’t really playing for anything but a nice trophy that few people really care about. Not only that, but there is a month layover after the games that really count. Granted, anyone who lost more than a game or two was out well before the season ended, but there were few teams who didn’t at least have a rivalry game to get excited about in the last couple of weeks of the season. Also, what often happens is a team will be disappointed or disinterested in a bowl game. There is a lot of talk about let-down games during the season, but a fair percentage of the time the better team ends up winning games like that. It’s a little bit different in bowl games. A relative lack of interest and motivation over a month makes a bigger difference than over a week. Also, you’re pretty much guaranteed an opponent who will beat you if they have a fairly good game by their standards and you have a fairly poor game by your standards. Nonetheless, if you take the bowl games as one week, that’s still the most important playing week of the season when determining relative conference strength. The most important consideration for me is how many wins a conference has. I think this is more important than winning percentage, because winning percentage is based more on who your competition is and which teams you have qualify. If only your best five teams are put to the test in a bowl game, what about the other half or more of your conference? They wouldn’t likely have won bowl games. Also, you have to look at who the wins came against. The SEC, the #1 conference going into the bowl season, had the most wins with 7, 6 of which were against Power 5 conferences. The SEC had 12 teams qualify (and was very close to a 13th). The ACC was second with 11, but the ACC only won a total of 4 bowl games, two of which were not against other Power 5 conferences. Where I may part with some is I believe strength of schedule should not only be evaluated in the abstract (how good the opponents are on their own) but also by how difficult the opponent is in light of how highly ranked the conference member. For instance, the most impressive non-conference win of the season in my opinion was by the ACC when Virginia Tech beat Ohio St. Virginia Tech was about #10 in the ACC, and they beat a team that made the championship game. If Florida St. had beaten Ohio St. instead, it would have been a lot less impressive. All of the Pac-12 bowl games were fairly even match-ups. I think the combination of Arizona and Utah was a fair match for Boise St. and Colorado St. of the MWC. Each conference won one of the two. The combination of UCLA and Washington was also a fair match for Kansas St. and Oklahoma St., and again each conference won one of the two. Since there were no other losses, everything else goes in the plus column for the Pac-12. Of course, Oregon beat Florida St. going away. Arizona St. was #4 in the Pac-12 and beat the ACC #5 Duke. Stanford was #7 in the Pac-12 and beat Big Ten #6 Maryland. USC was #5 and beat Big Ten #5 Nebraska. Returning to the SEC, the results were contrary to what one would have expected. Most of the season, the top five teams of the SEC West beat all the other teams. It wasn’t until the last few weeks that that group lost to ANYONE else. Auburn lost to Texas A&M and Georgia, and Ole Miss and LSU lost to Arkansas. Still, it was interesting that three of those losses were still inside the SEC West. Also, despite the fact that the SEC lost more inter-conference games in rivalry week than it had lost the entire rest of the season combined, not a single one of those losses were by the SEC West. Those five top SEC West teams were curiously the only teams to lose bowl games though. I think part of it was that disappointment, letdown sort of phenomenon I mentioned, but obviously that wouldn’t apply to Alabama. I think what happened there is the Tide defense got worn down, and then the Tide offense couldn’t keep up with the Buckeyes. That’s not the kind of game Alabama is accustomed to having to win, although they did manage to win a similar game against Auburn. Also, those teams gave each other a beating. The most notable injury in an inter-SEC West game was to Laquon Treadwell, but I know LSU lost a lineman in the Alabama game, and some other players (such as Kenny Hilliard) were banged up as well. Out of the five games lost, there was only a game and a half that was bad. Auburn took Wisconsin to overtime, LSU lost in the last second, Alabama was alive in their game until the final minute. The second half by Mississippi St. and the whole game by Ole Miss were pretty ugly though. I believe I counted accurately that despite those five teams not winning any bowl games of their own, they got a total of 18 wins over teams that won bowl games. That’s more than the top five of any other CONFERENCE. The only one that comes close is, of course, the Pac-12. I was a bit surprised that with Arkansas playing Texas in Texas (#10 SEC vs. #6 of the Big XII), Texas A&M playing West Virginia (#9 SEC vs. #5 of Big XII), South Carolina playing U. Miami (#12 SEC vs. #10 of the ACC), and Tennessee playing Iowa (#11 SEC vs. #7 of the Big Ten), no other SEC team lost a game. I won’t pretend I was at all surprised by Missouri, Georgia, and Florida winning all of theirs, but that doesn’t make them count for less. It’s frustrating that there were no games between the SEC and the Pac-12 of course, but there are a few different ways to look at this. There were four bowl wins by the Pac-12 over teams in the top 5 of power conferences and two losses to other teams. If we limit that to the top 4, the Pac-12 had two wins inside and two losses outside. The SEC had three bowl wins over teams in the top 5 of power conferences, and Notre Dame was the only loss outside of that group. Notre Dame barely had a winning record against Power 5 opponents (even though they generally played pretty good ones), but we don’t have to count them as of that quality. Of course, if we discount the Irish too much, that devalues the season as a whole for the Pac-12 (three games against them vs. only one by the SEC). If we limit it to the top 4, it’s two wins and one loss. These are both better ratios than the Pac-12 had. I would also note that the Pac-12 didn’t have a sub-top-5 team beat a top-5 team of another conference. Here’s another way to look at it. The Pac-12 wasn’t really over- or under-matched in any of their games, so they’re 6-2 in games in which they weren’t over-matched or under-matched. The SEC was 3-2 in games in which they were over-matched. The wins I mentioned were by Arkansas, Texas A&M, and Tennessee; the losses were by Ole Miss (#4 SEC vs. #1 [tie] in the Big XII) and Auburn (#6 SEC vs. #3 in the Big Ten). You could argue Florida was under-matched by East Carolina (#8 SEC vs. #4 American/AAC), but even though they struggled against the top of their own conference, East Carolina did beat ACC #6 North Carolina 70-41, so I think it’s fair to say that was basically even as well. If the SEC and Pac-12 had the same number of teams, I would honestly struggle to pick a better conference despite the Pac-12’s 75 winning percentage in bowls vs. the SEC’s 58.3%. But since ½ of each conference won bowl games, I think it’s fair to give the Pac-12 a little slack for not being over-matched in any games and for having a smaller percentage of teams qualify. So they’re my #1 for the bowl “week”. I do want to note that I don’t blame the Pac-12 for not having better bowl opponents. 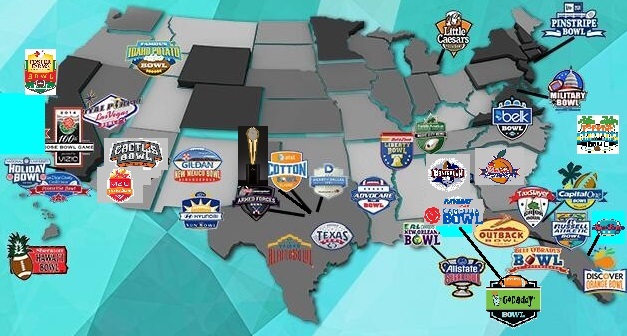 There aren’t that many great bowls out west that the other major conferences really want to play in. Also, the bowls in the East aren’t particularly disposed to trying to get Pac-12 opponents. Just because they’re good teams doesn’t mean a large group of fans want to travel two or three thousand miles to go to the game. But just like with my team standings, I can only judge on the games that actually take place. I covered all the commentary I intended to cover Sunday morning, but I just wanted to note that I’m not making a new rankings blog after the Army-Navy game. I don’t expect any changes to the top 25. I will update my ratings site because obviously this would affect some lower teams, including Army and Navy themselves, and strengths of schedule. 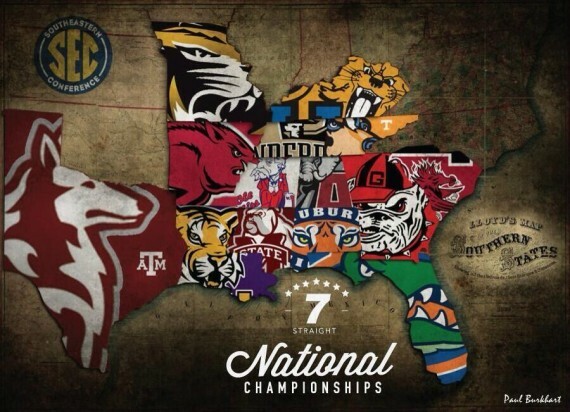 This is my favorite SEC map so far. I will do a “conference report” for the season at some point (there may or may not be one before the bowls). This is the full one for last year to give you an idea, but I didn’t want to wait until then to make the basic argument that when looking at inter-conference play, the SEC is still the best conference overall; and it’s not even that close. I mentioned this last week, but since then I’ve seen an increasing number of people say or suggest that the SEC must not be the best conference since it is 5-6 against other Power 5 opponents out of conference. One thing that’s telling is they’re saying different conferences are #1, but many of them don’t really defend that, they just act really confident that whoever it is, it’s just for sure not the SEC. It’s kind of like saying Alabama shouldn’t be #1—because they lost to Ole Miss, should have lost to LSU, and gave up over 600 yards against Auburn and (had those Tigers not settled for field goals so often) probably should have lost that one too—and then simply ignoring that any other team you would suggest is just as flawed if not more flawed. To be fair, I’m not sure if they’re all talking about top to bottom. Maybe some think the combination of TCU, Baylor, and Kansas St. is better than the combination of Alabama, Mississippi St., and Ole Miss, for instance. As an aside, I would also argue with that assertion. The top three SEC teams are 2-1 against Auburn and the three Big XII teams are 0-1 against Auburn. I would also value beating WVU (which Baylor failed to do, by the way) and Boise St. above the one good out-of-conference win of TCU over Minnesota. Five of the six Power 5 losses by the SEC were to teams that are currently ranked in a major poll. The only loss to a team from outside of the Power 5 conferences was by Vanderbilt, which went 0-8 in conference. I have acknowledged that the loss by Missouri to Indiana (obviously the Power 5 team not in any major polls) was a bad one, but that was the #4 team in the SEC. I don’t see it as worse than the #1 team in the Big Ten losing to Virginia Tech, for instance. As for the wins, three of the five came against ranked teams (and they came against teams in the top three of other conferences). These are SEC #7 LSU beating Big Ten #3 Wisconsin, SEC #5 Georgia beating ACC #3 Clemson, and SEC #6 Auburn beating Big XII #3 Kansas St.
You really have to use some tortured logic to say that any of those conferences belong ahead of the SEC. I know the ACC just beat four SEC teams (also, the ACC has almost as many bowl teams), but let’s consider what that looks like if the roles were reversed. Rather than it being the top 4 of the ACC versus numbers 5, 8, 10, and 13 of the SEC, let’s make it top 4 of the SEC versus numbers 5, 8, 10, and 13 of the ACC. Does anyone seriously think the SEC is likely to lose one of those? Mississippi St./Boston College (the equivalent of Georgia/Georgia Tech) might be a good game, but people would make fun of Alabama and Missouri for playing these games. Ole Miss wouldn’t exactly be drowning in praises with a win either. They get almost no respect for having beaten Boise St. as it is. As I mentioned, the SEC did beat the ACC in a game earlier this year (the equivalent match-up would be Boston College @ Ole Miss), so at best they would also have gone 1-4 but more likely 0-5. I mentioned the SEC only lost one game outside of the Power 5 conferences. The ACC lost seven such games, including to such luminaries as Akron (by a bowl-eligible team) and ULM. The ACC also lost two games to unranked Power 5 conferences when it lost to Iowa and Maryland. So since I’ve eliminated the others, the only conference you can even pretend might be as good as the SEC is the Pac-12. I mentioned the SEC only lost to one Power 5 team that is not in the top 25 of either poll. Counting Notre Dame as Power 5, the Pac-12 lost three such games: Notre Dame, Boston College, and Rutgers. I also mentioned the SEC only lost to one team that was not in the Power 5. Again, the Pac-12 lost three such games: Colorado St., Nevada, and BYU. Meanwhile, the SEC has won 17 more games against other conferences than the Pac-12 has won. I mentioned the SEC (and three teams toward the middle of the SEC at that) beating three teams that are currently ranked. The Pac-12 has only beaten one such team, and it was Oregon, the Pac-12 champions, over Michigan St., the Big Ten East runners-up. The only strong win against teams not in the Power 5 for the Pac-12 is UCLA’s win over Memphis. An SEC team also beat Memphis. That was Ole Miss, who as mentioned also beat Boise St. Another SEC team beat East Carolina, and yet another beat Central Florida. You can’t honestly tell me the list of wins versus the list of losses favors the Pac-12. The Pac-12 is consistently in the top 2, but #2 is more questionable than #1. Just from skimming, it looks like the Pac-12 is #3 or lower in about one out of five. Judge for yourself, but just so you know, the one exception put Georgia Tech #3. How well would that have gone over if the Yellowjackets were going to the Rose Bowl to play Oregon and Florida St. were going to the Sugar Bowl? It had TCU and Baylor #8 and #9. They’re both behind Georgia. I don’t mean to make fun. Running an objective ratings system is hard work, and they look for and measure different things. I mention this because I didn’t want to just say they were wrong because they’re overwhelmingly outnumbered. I think people can recognize that this is not a system that agrees with what just about anyone (outside of Georgia anyway) thinks of as how the rankings should be configured. I know this is early in the day for most of you, but I’m not the one who decided to make the selection show so early for west coasters like me. I’ll just have to find out the final verdict after I get up and have breakfast. I’ll just do my regular top 25 blog later in the week, but for reference here are my ratings results. I use the numbers there below. 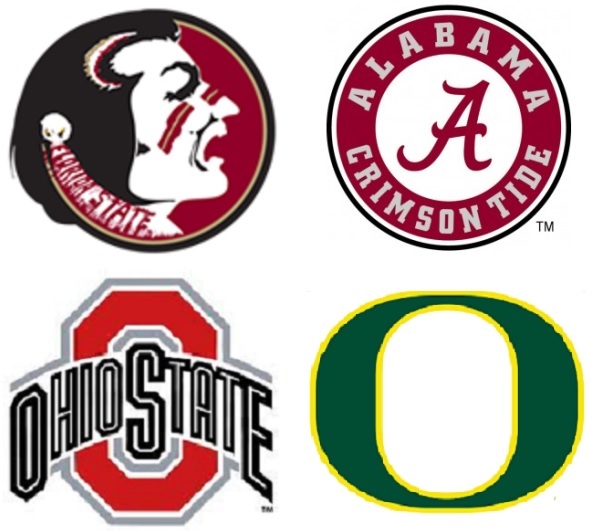 There should be no serious doubt about Florida St., Alabama, and Oregon, so I’ll skip to talking about the fourth semifinal team. Baylor’s win wasn’t really in doubt for the much of the second half, but I don’t think it was anything like the kind of exclamation point Ohio St. had. I had Ohio St. in the top 4 to begin with, so I am still convinced Baylor does not belong. Virginia Tech is a worse team to lose to than WVU, but my feeling is the two additional wins over the top 50 make up for this. I respect the opinion that TCU belongs ahead of Ohio St., although obviously I don’t agree with the conclusion. 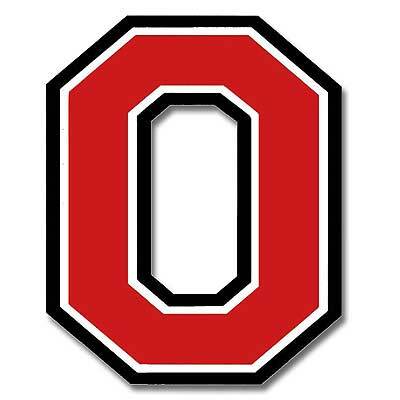 I think Ohio St. just showed emphatically they can play like a top 4 team. Admittedly, they showed all those weeks ago they can also lose to a mediocre team at home by two touchdowns, but at some point, the other 12 games taken as a whole should be more important. One top-25 win vs. 2 and 5 top-50 wins vs. 4 make up for that. TCU played the best of any of these teams in their loss, but actually that might have been their best game. I just haven’t seen them look like a top team often enough, particularly in light of their difficulties against West Virginia and Kansas in the month of November. Transitioning out of the semifinal discussion, I don’t think Marshall and Boise St. are getting the respect that previous “group of five” teams with similar records have gotten in the past. Hawaii in 2007, for instance, was #11 after starting 11-0. Marshall, which has actually had a better schedule this season, was #19 after starting 11-0. I do think Marshall and Boise St. may each be a couple of spots too high in my ratings though. I mentioned briefly last week why I had Boise St. ahead of Arizona, and now it’s similarly problematic to have Boise St. ahead of Baylor. There is a higher depth to Boise St.’s wins, but ultimately beating top-20 teams should be valued more highly. I want to try to find a way where beating #5 and #19 counts for more points than beating #20, #49, and #69. Those aren’t Boise St.’s three best wins (they beat two others in the top 60), but they just happened to combine for slightly more points than Baylor’s two best wins. One way I thought of was adding some kind of additional credit for beating teams that end up with positive ratings (which is usually approximately the top 40). I won’t alter the formula at this point this season though. I will tinker with it after the final results of this year to see how it turns out. I will also look to see how it would alter previous ratings. Something else I want to note is Boise St. actually has more FBS wins than Baylor because they played an extra game and did not play an FCS opponent. So where usually a team with two losses has fewer wins than one with a single loss, the two-loss team in question has more wins. In an average playing week, Baylor did accumulate more points than Boise St. did in an average week. One reason I say Marshall may be a spot or two too high is that I think Michigan St. should be in a major bowl. Their only losses are to teams I believe should be in the top 4. Wisconsin was technically the Big Ten runner-up, but they lost an additional game, and they lost to LSU and Northwestern. LSU isn’t a bad loss, but Northwestern is pretty bad. They don’t even qualify for a bowl game. I mention those together because they’re in the same conference. I also think UCLA should be included in the top 6 bowls, while Georgia Tech should be excluded. The two teams finished with the same number of losses, and there were understandable losses by both and fairly weak losses by both. UCLA’s non-conference slate of Virginia, Memphis, and Texas, combined with the strength of the Pac-12 South relative to the ACC Coastal, should put them ahead. Florida St. was actually two possessions ahead of Georgia Tech going into the last couple of minutes, which is a gigantic lead for the Seminoles, so the final score being two points doesn’t sway me. Also, I give them credit for the one strong out-of-conference win (albeit an extremely lucky one) against Georgia, but the others were Wofford, Tulane, and Georgia Southern. I haven’t exactly made the case why UCLA should go ahead of Wisconsin or Michigan St. should go ahead of Georgia Tech, but hopefully you can fill in the blanks there. The only other thing in the top 25 worth commenting on is a team that hadn’t been there since my (subjective) preseason ranking…. We can also add Northern Illinois to the list of “group of five” teams that may be a spot or two too high. After Arkansas’s games against LSU and Ole Miss made that blowout loss more understandable, that only leaves one other loss for the Huskies against 11 wins. Like Boise St., Northern Illinois goes up an extra spot for playing an extra game. If I averaged by playing week, they would have stayed behind Louisville. 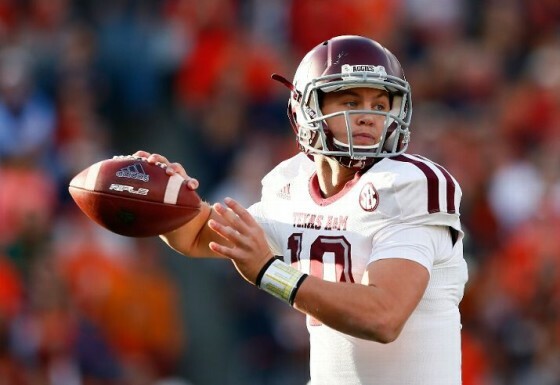 But as a more traditional passer, Kyle Allen presents a very different test. LSU was the only team that went 2-0 against “Johnny Football”, but as the captions above indicate, that’s not necessarily a reason for confidence going into this game. 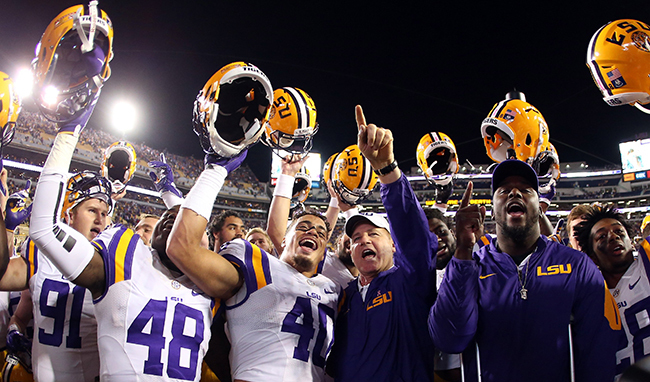 If you missed it, I wrote about LSU’s quarterback situation last week. For the last few weeks, I’ve been waiting until I can compute the Mock BCS standings before writing a blog about my rankings. Unfortunately, one of the formerly BCS computer rankings still has not been released for this week, so this could not be done on time tonight. You can still access my ratings for all 128 teams here, but you’ll have to wait until tomorrow or the next day for the blog that I write to accompany them. I updated my LSU-Texas A&M “Rivalry Series” blog after last season’s game, but I thought of a few more possibly interesting tidbits. Pac-12 teams are moving up, in part due to Arizona St.’s win over Notre Dame. Just like last week, there are no newly-ranked teams for the season, so there are no team logos. There are 39 teams total that got at least some level of “Mock BCS” points, so you can follow the link below to find them all. It makes me sick to have to give Alabama credit for a win and to penalize LSU for a loss, just so you know. At least now I don’t have to cheer for the Rammer Jammers in any of their remaining games. 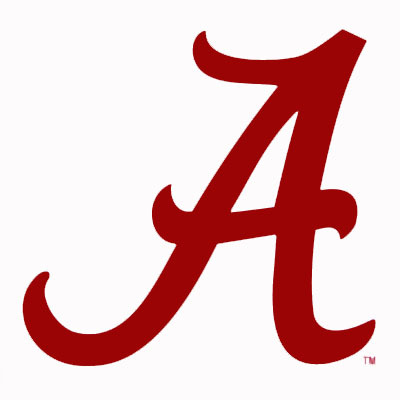 I haven’t forced myself to cheer for Alabama since Thanksgiving Day of 2010 (I was neutral when they played Notre Dame in January 2013); but if LSU had kept winning, I would have had to cheer for them in one or possibly both of their remaining games. Anyway, Oregon is #2 for the moment, but things will even out when the Ducks have a bye week next week. If I were to account for the extra week now, Oregon would actually be #4. I was pleased that my rankings gave some credit to the Pac-12. I didn’t make a rankings system to favor one conference (and neither did any of the widely-recognized systems). So while it’s not quite as strong as the SEC West (everyone but Arkansas has no losses outside the division), the Oregon/Arizona St./Arizona/UCLA group of teams has played well enough to help one another out, especially with ASU’s win over Notre Dame. UCLA did lose to Utah, and Arizona did lose to USC, so that’s why it’s not quite the same as the top of the SEC West. I explained the circumstances, but the fact that Oregon is close enough to Alabama in the first place shows that it’s not impossible to break into the group of SEC teams even if they weren’t beating each other constantly. The best Pac-12 team with two losses isn’t ahead of the best SEC team with two losses (Ole Miss), but they are ahead of the second-best (Auburn). Arizona St. only has one loss; but unlike UCLA, they won’t play Oregon until the Pac-12 championship (if at all) and they haven’t played Arizona yet. UCLA’s win over Texas is also looking better after the Horns beat WVU. I skipped Florida St. They should be a somewhat comfortable #2 next week if they win. U. Miami is possibly the best three-loss team (after LSU anyway). One of the Hurricanes’ losses is to Nebraska, and they are the only team to beat Duke. Auburn/Ole Miss is not a mistake or oversight. Even though Auburn beat Ole Miss, I still think the Rebels belong ahead. Ole Miss is 1-0 against the top two teams in the West, and Auburn is 0-1. Also, the loss at LSU is more forgivable than the loss at home against A&M. TCU and Ohio St. are where they belong. Basically, the wrong teams won. Either conference’s best chance was for the teams that were undefeated in conference with respectable out-of-conference losses (Michigan St. to Oregon and KSU to Auburn) to win out. TCU’s best win is the one they just had over Kansas St. The Oklahoma win is looking less impressive now. The Frogs beat Minnesota out of conference, but their games against Samford and still-winless SMU don’t help them out much. Of course, Ohio St.’s loss to mediocre Virginia Tech is going to be difficult to overcome, but they may have an outside shot if they can beat Nebraska (preferably if they don’t incur any further losses) in the Big Ten championship. There is then a huge gap before getting to #11, Colorado St. The Rams have a bye week, followed by New Mexico, so there will be plenty of opportunity for teams to pass them. Marshall already had its bye weeks, but the best team on their schedule right now (pending whoever wins the other division) is Rice. Nebraska is between the two mid-major/group-of-five teams, but as I indicated, they can find their way to move up by winning. 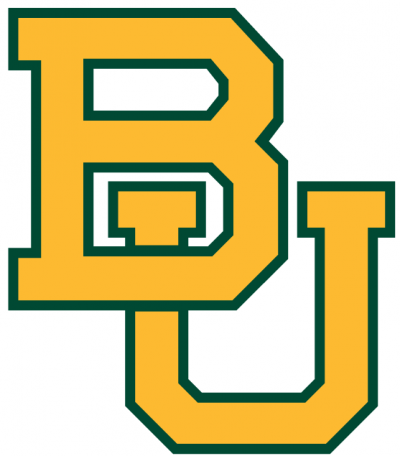 Baylor only has the one loss, but the Bears played SMU, Northwestern St., and Buffalo out of conference. Also, they have yet to play Kansas St. That’s on championship week, so I guess it will be a good chance to make one last statement if the Bears keep winning. Boise St. is not likely to move up very much. Notre Dame can move up a little bit, but neither of those will be particularly relevant with two losses. Duke certainly still has some potential for points being that they may earn a rematch in the ACC title game with Florida St., but there isn’t too much before then. Everyone else is mostly just jockeying for non-CFP bowl consideration. Georgia, LSU, and Texas A&M don’t want to fall too far down the list of SEC bowls (I don’t think the Bulldogs want to see Jacksonville again, for instance). Michigan St. looks like it may be playing an SEC team somewhere in Florida. I mentioned Kansas St. and Arizona earlier. They look out of their respective conference races for the moment, but there are big games left. Georgia Tech and Clemson will square off for best two-loss ACC team.